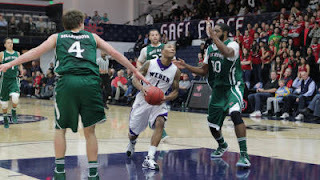 At the end of last week, a report came from CBS' Gary Parrish that said Damian Lillard would be entering the NBA Draft. Roy Burton of the Standard-Examiner then said that according to Lillard, there is no decision yet, but that Lillard is leaning toward the NBA Draft. There is nobody more plugged into Weber State than Burton, and Lillard is not a guy that I picture as trying to pull any fast ones, so I believe he hasn't 100% made up his mind yet. But it would certainly be a shock if Lillard does not go pro. As we have said on here, his stock will probably not be higher than it is now, coming off a season where he was the conference MVP and a third team All-American. This is also a weak PG class, and the thought is that Lillard has a great chance to be the first PG off the board. It is easy to see why. Nobody could blame Lillard for cashing in on this opportunity. Arguably, he is making the smart choice if he goes, and I think most Weber State fans realize that. It sure would be great to see him playing another year in Ogden, but if he were asking my opinion, I would turn pro if I were him.